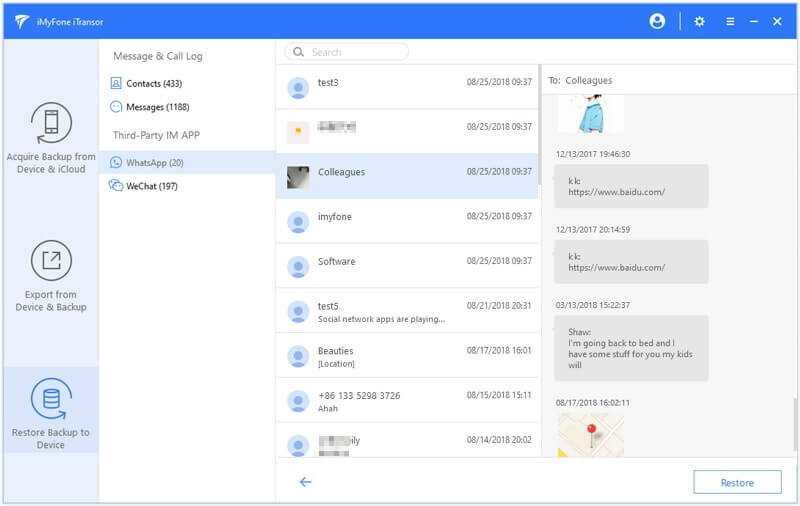 Whenever it comes to changing iPhone or transferring data to a new iPhone (iOS 12 included), how to extract Apps from iPhone backup is among the most asked questions that bother users the most. There are some software applications and tools available in the market to assist you in doing so. Ensure that you choose the right one with enough credentials, to avoid getting ditched. 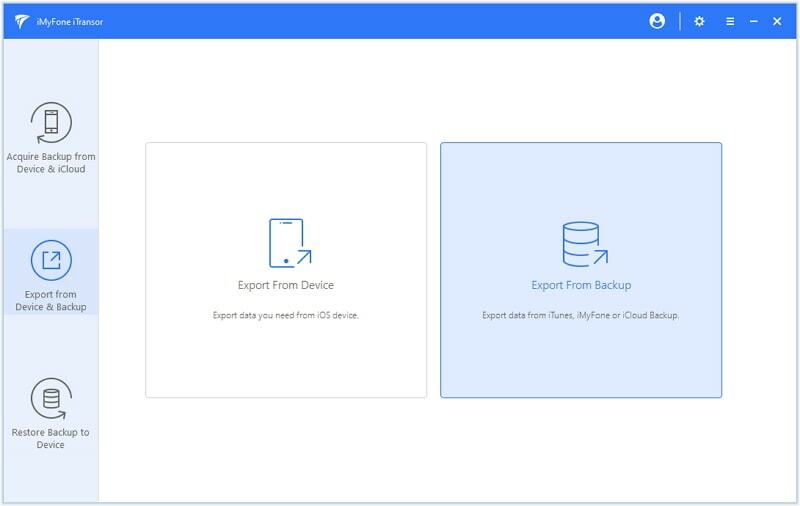 Through this article we are going to explain you one of the best solutions to export App data from iPhone backup through iMyFone iTransor (suppors iOS 12). 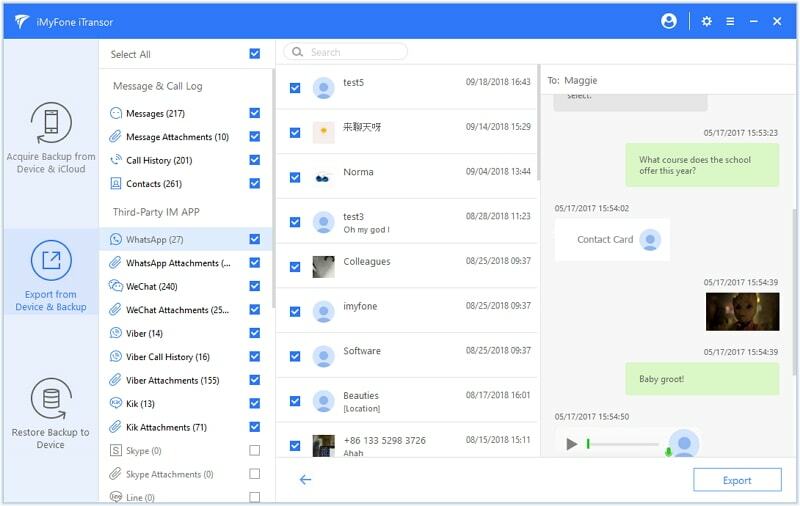 To extract App from iPhone backup, iMyFone iTransor is an ultimate and a trustworthy solution that is utilized and recommended by millions of users worldwide. It supports to export more than 20 types of data from iTunes/iCloud backup or even your iOS device. You can even preview the data on your iTunes or iCloud backup prior to extraction. Moreover, this tool is fully compatible with both Mac and Windows operating systems. Here is the step-by-step guide to know more about how to extract App data from iTunes backup. Step 1: From the official website of iMyFone, download the iMyFone iTransor tool, install and launch it on your computer. Once you have the main screen of iMyFone iTransor, click on 'Acquire Backup from Device & iCloud' tab on the side panel. Then choose 'Export From Backup'. Step 2: Now, you are required to select the preferred iTunes backup file from the list of backups available on your screen. Choose the iTunes backup you wish to view and export App from iPhone backup, then tap on 'Next' to go ahead. Note: In case iTunes backup is encrypted, you would require entering the password. 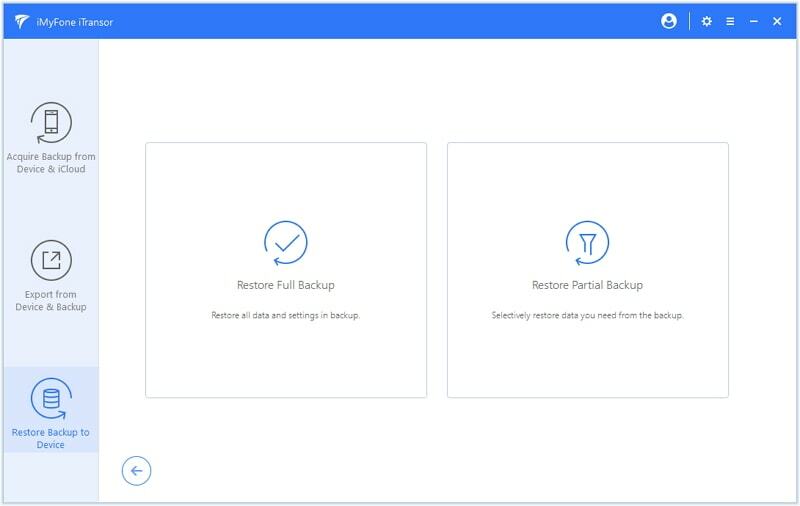 Step 3: From the list of data types make sure to check only the preferred data types that you wish to extract from the backup and then hit 'Scan' button. Step 4: You can view the entire selected data from the iTunes backup file once the scanning gets over. Select the preferred Apps and then tap 'Export' button. Within a short while, it will extract apps from iPhone backup to your PC. 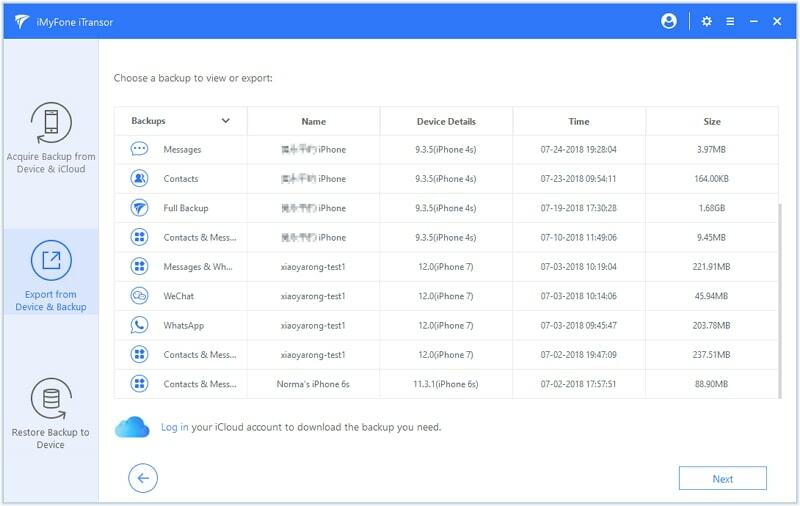 Apart from iTunes backup, you can also extract App from iPhone backup you've made on iCloud using iMyFone iTransor (compatible with iOS 12). Here is the step-by-step guide to extract App data from iCloud backup. 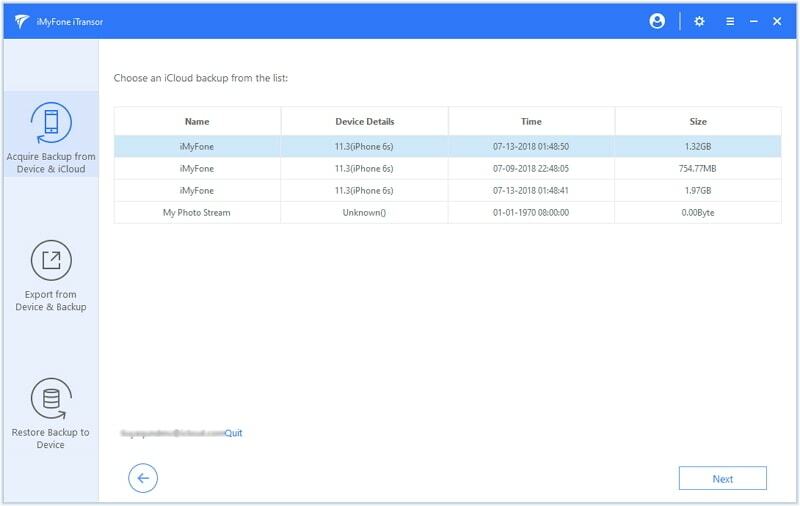 Step 1: After launching iMyFone iTransor, tap on 'Acquire Backup from Device & iCloud'. Click on 'Download iCloud Backup' from the 2 options on the screen. 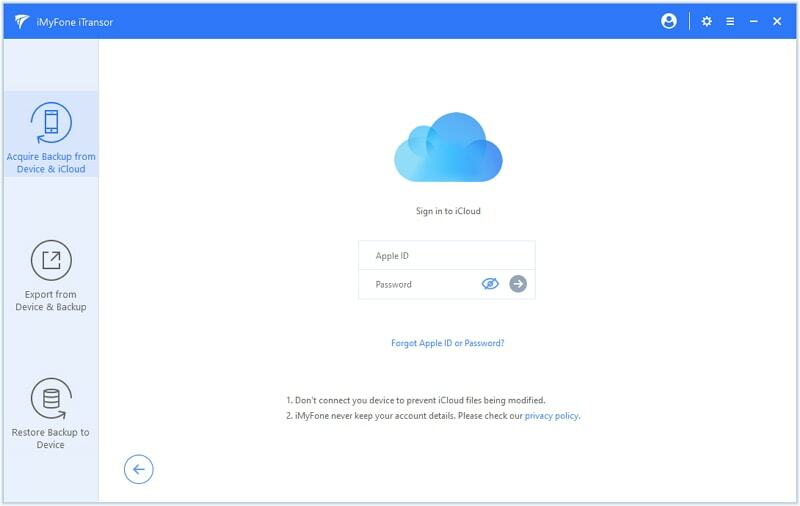 Use your iCloud credentials to login to it and download your iCloud backup. Step 2: After login, all the backup files within your iCloud account should be visible. Select the relevant backup file from the list and tap 'Next'. The tool will then automatically download the iCloud backup file to your PC. Step 3: Click “Export from Device & Backup”, choose the backup you just downloaded and click "Next". 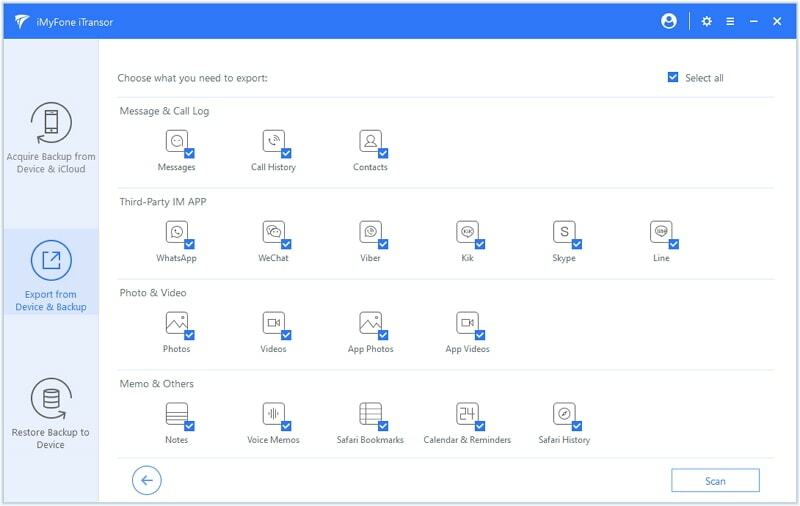 Now, select the data types you want to extract - Message/WhatsApp/Contact/Call History and more from the list, you can also select 'Select All' and click 'Scan' to proceed. Step 4: After the scanning process is over you can preview the list of items from the iCloud backup file and choose the desired ones to get extracted. Crosscheck the choices and tap 'Export', it will then save the data on your computer. You can also restore a single App from iPhone backup i.e. from iTunes or iCloud without any hassle via iMyFone iTransor (supporting iOS 12). It is basically a backup and restore tool. You can use the tool to selectively backup your iPhone for free. You can also use it to flexibly restore iTunes/iCloud backup instead of restoring the whole backup. 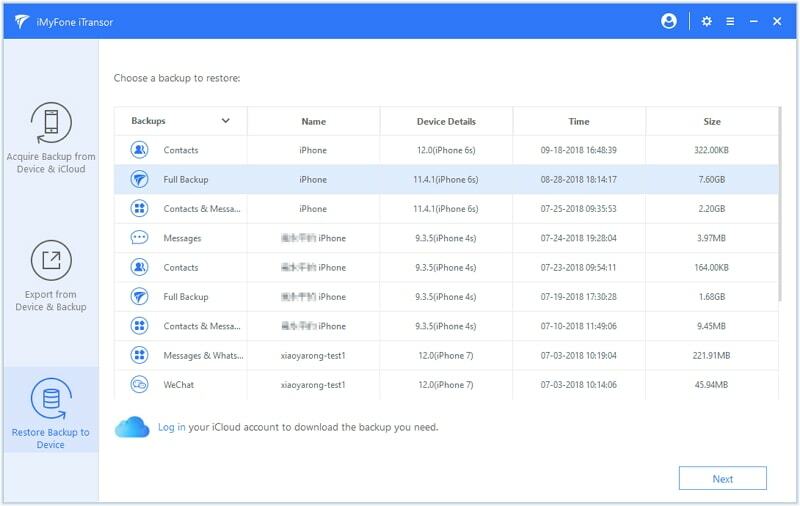 Here we will take iTunes as an example, and show you the steps to restore Contacts/WhatsApp/WeChat/Messages from iTunes backup to your iPhone. 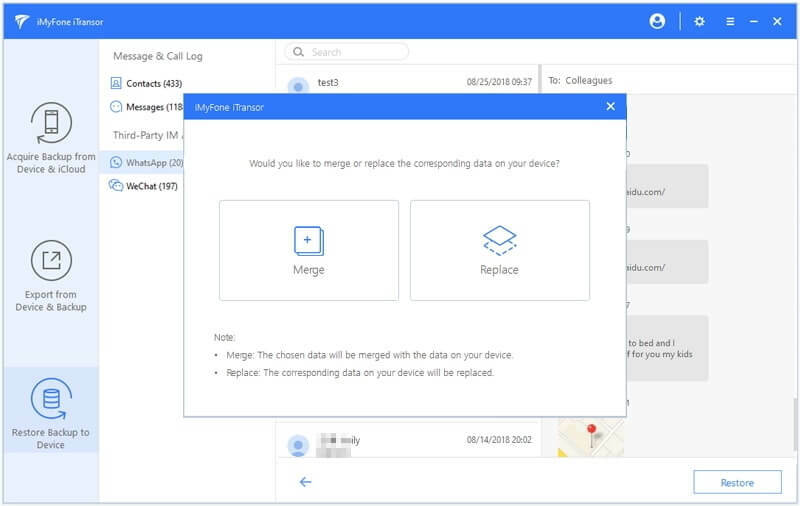 You can also merge with the data currently on your device. 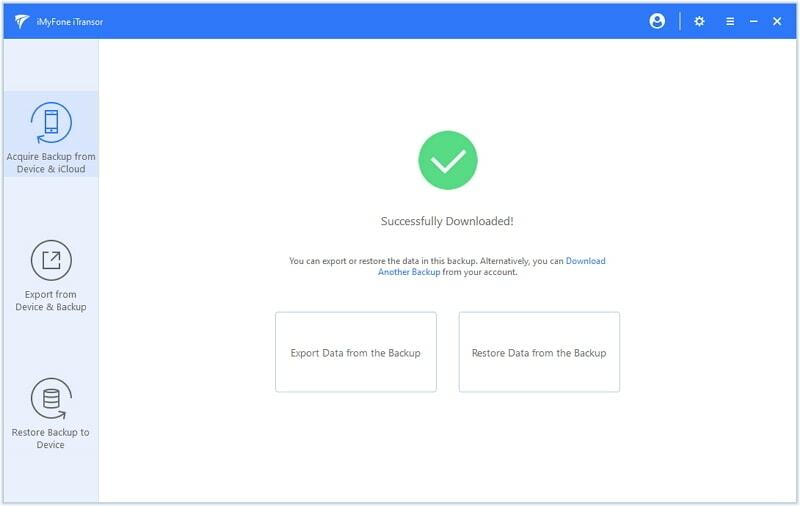 Step 1: Once you launch iMyFone iTransor on your computer and connect the iPhone, tap on the 'Restore Backup to Device' option from the side panel. You will see a list of backups, click on an iTunes backup and tap 'Next'. Step 2: The next screen after choosing an iTunes backup will show you two options, choose 'Restore Partial Backup'. Keep your iPhone connected throughout the process. Step 3: You need to select from the supported apps listed on the screen to restore, or you can check all to restore all of them. At the right bottom corner, you can choose either 'Preview & Restore' or 'Directly Restore' . Step 4: If you choose 'Preview & Restore', then program will start to scan your backup. Once the apps you've chosen gets scanned, you will see the data on the interface. Now you can tap 'Restore'. 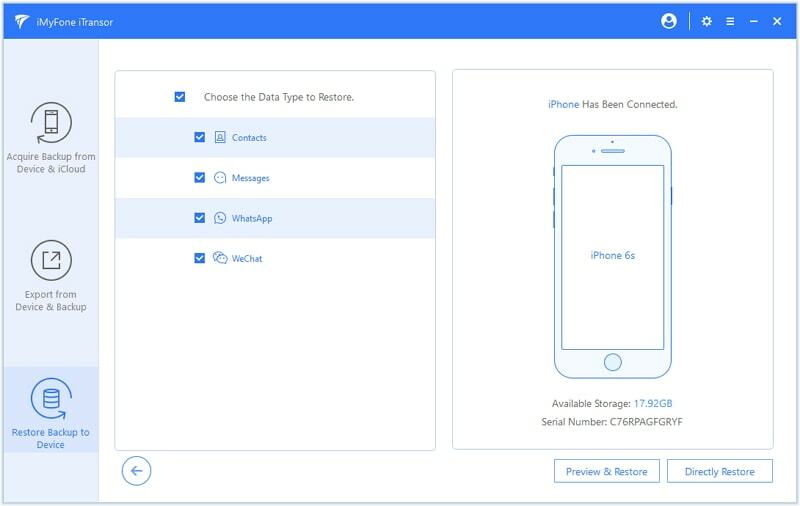 It will restore the app data without messing up with other data types on your iPhone. Before restoring, you can choose to Merge or Replace the corresponding data on your device. Just choose according to your own needs. Then the program will start to restore the data and it will be completed soon.